Speaking and craft activity to practise colours, numbers, jobs, letters of the alphabet and future simple. Materials: a sheet of A4 paper (one for each child), crayons, a pencil, scissors. 1. 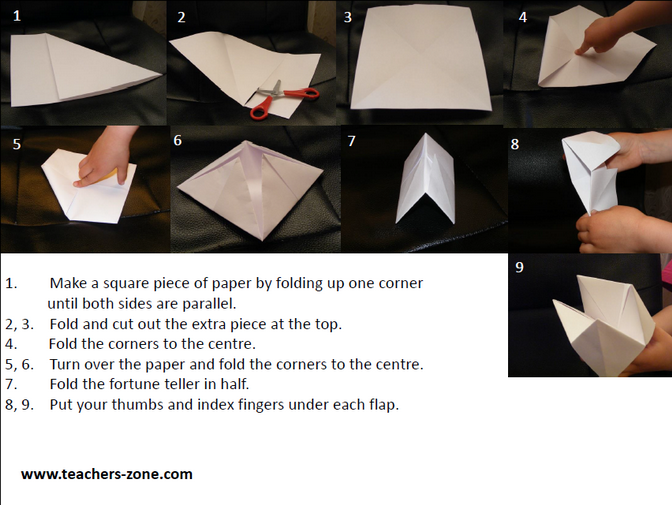 Demonstrate how to make a fortune teller. 2. Ask the children to colour the outside flaps different colours. 3. Ask the students to write numbers 1-8 on the inside. 4. Ask the children to write messages on the other side of flaps with numbers. In the example: You will be a vet / fire fighter / pilot / teacher / singer / lawyer / gardener / police officer. STUDENT 1: What’s your favourite colour? 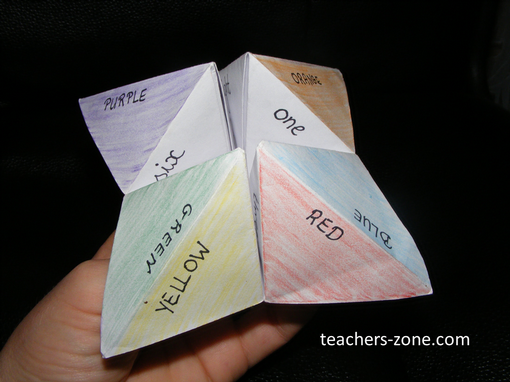 STUDENT 1: G-R-E-E-N (student 1 spells the letters and opens and closes the fortune teller as many times as the number of the letters in the chosen colour). Choose the number. STUDENT 1: (student 1 reads the message written under the number 6) You will be a police officer.